Well the weekend for the Night of Artists has come and gone for another year and it was a lovely experience. Not only did I get a chance to sell and discuss art outside of the Fort, but I got to meet and chat with fellow creatives and start a few friendships. Here are a few pictures of the weekend! If anything catches your eye shoot me a message to purchase. I offer free delivery of large pieces in the Edmonton and surrounding area. This entry was posted in 2019 Artwork, Abstract, acrylic, art discussions, Art Events, Art Exhibit, artist looking for gallery rep, Artist seeking representation, Artwork for sale, canvas, Christian Art, Christian Artist, Christian Themes, CIVA, Color Exploration, Color of Music, Craftsmanship, creative, faith based art, female artist, For Sale, Fort Saskatchewan, Gallery, God, God/Religion, NOA Night of Artists, Paintings, SALE/CLEARANCE, spiritual gifts, support living artists, support the arts, Uncategorized on March 29, 2019 by Amanda. I’m excited to be participating in the Night of Artists this year and part of the perks of joining in this fabulous event is their NOA magazine cover competition. This year there are 49 wonderful artists participating in the competition. I decided to submit “New Song” as my entry this year as I thought it embodied the NOA festival being both an instrument and an art piece. The competition is popularity based and the top 5 most liked artists will move on to the finals for a chance to grace the cover. The votes are open to the public so if you’d be so kind to cast your vote for me and any others that catch your eye just click on the guitar image below and follow the link to the official page, press like on my guitar and then voila done. Voting ends on January 31st at 9pm Alberta time. Thanks everyone for supporting my Art! This entry was posted in 2018 Art, 2019 Artwork, Abstract, acrylic, Art, Art Events, Art Exhibit, Artist, Artwork for sale, canada, Christian Art, Christian Artist, Color Exploration, Color of Music, creative, events, female artist, Fort Saskatchewan, Inspiration, Mixed Media Paintings, Musical Instruments, My Creations, NOA Night of Artists, Paintings, photos, support the arts, Uncategorized, Women in Business and tagged #NOA2019, #NOAArtwalk2019, Alberta artist, AMilke, art contest, Canada, Canadian Artist, Contest, contest entry, Edmonton, fort saskatchewan, FortSask, guitar, mixed media artist, mixed media guitar, New Song, Night of Artists, NOA magazine cover contest, please vote, support living artists, YEG on January 12, 2019 by Amanda. Well it’s official! I am all set up at the Fort Saskatchewan ALFA Gallery. It feels like it’s been a long time coming but it’s here. Here’s a sneak peak of the set up. So if you’re in the area please check it out and sign the guestbook. Also, all works on exhibit are available for sale. I’ll be posting more pictures and video and my interview with the local radio station I did yesterday are coming so stay tune! This entry was posted in 2018 Art, Abstract, acrylic, Art, Art Classes, art discussions, Art Events, Art Exhibit, art supplies, Art Videos, Artist, canada, canvas, Christian Art, Christian Artist, Christian Themes, CIVA, Color of Music, creative, events, exhibit, Exhibits, Faith, Fort Saskatchewan, Gallery, God, God/Religion, Golden, Guitar, Home Studio, Inspiration, interview, Mixed Media Paintings, Musical Instruments, My Creations, paint, Paintings, photos, Series, Uncategorized on June 6, 2018 by Amanda. I’m taking a slight break from Canvas Paintings & Jewelry to start work on a new entry into my Color of Music series. I’ve had it in the back of my head that I’d love to do a gallery exhibit of a bunch of my painted instruments but so far every one I’ve done has sold not that I’m complaining ;), but it does makes it a tad difficult to put on an exhibit without any pieces in my possession lol. So today I dug through my stash of goodies that I have squirreled away in my studio and picked out another guitar to start working on tonight. 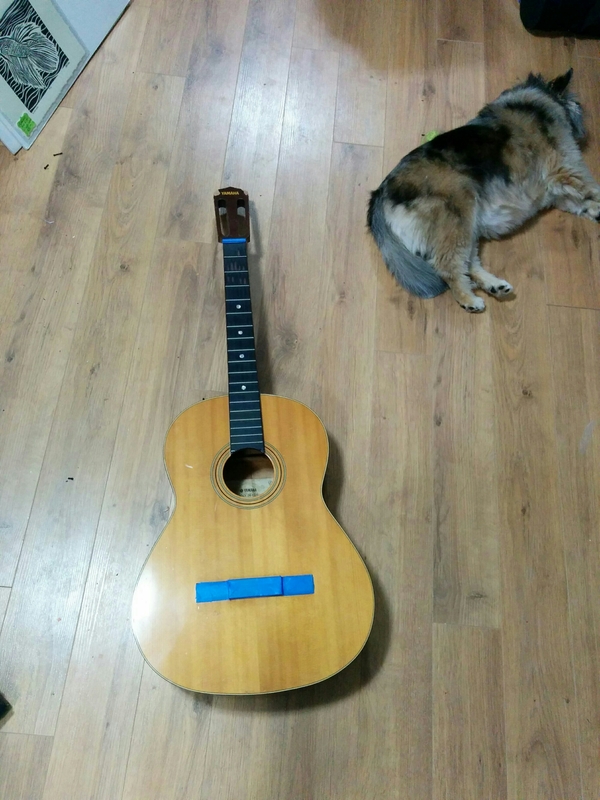 I had a few electrics, another child’s acoustic and this big acoustic that I thought would be a nice change since my last piece was an electric and the one before a child acoustic. As you can tell, my dog likes to sleep in my studio 🙂 and couldn’t be bothered to move heh. I have a general idea of what I want to do with this piece but I won’t tell at the moment until I start and sort things out 🙂 but stay tuned and I’ll post as I work on it over the next few days. This entry was posted in 2015 Artwork, Abstract, Art, Art Exhibit, Artist, canada, Color of Music, Creative Kick Starts, Fort Saskatchewan, Guitar, Home Studio, In Progress creations, Inspiration, Musical Instruments, My Creations, paint, Recycled Art and tagged abstract guitar, acoustic guitar art, acrylic painted guitar, Art, art commission, Color of Music series, guitar commission, music, Musical Instruments, painted guitar on June 14, 2015 by Amanda.